I like Shanath for a High Rock tribe, but Dratt less so. The mesa tribe can be called the Verlihhki. Verlihhki sounds spot-on to me. Good, it's a combination between the var/wer/were pre-fix and a Saami word for human skin. http://i.imgur.com/ZLtP6vU.jpg Typical Nourthu camp. This is Laahku Camp, in the eastern parts of the region. It's a seasonal campsite for reindeer herders, with the foodhut and the fences as the only permanent structures. Now that looks surprisingly great. Kind of like Redoran architecture in Velothi mountains - you imagine a tileset is proper for different enviroment, and then it turns out to look great in a snowy area too. The question is would that be worth the effort? I don't know a thing about Blender myself. You know, with our new concept for the Reachmen, I can't help but feel it might've been better to make the Reachmen a race, and not a faction subcategory of the Bretons. The Ashlander faction worked fine in the vanilla game, but there's a lot more about the Reachmen that separates them from regular Bretons compared to what separates Ashlanders from settled Dunmer. But even disregarding lore, there are game mechanic reasons that make a new race desirable. I am %Name, %Class and %Rank of the %Faction tribe. I wouldn't take too much work to change at this stage, though I understand if others wouldn't want to do so at this stage. I would definitely support that, but let's postpone it for now, shall we? At least until after this release. Then we can also advertise our mod with "Playable Reachman race!" I'm not able to check this now, but how is the quality here? If we could just make a few alterations and a new texture, it would be a good thing to have a generic deer creature. Ideally that would be a great solution, but I'm against it for the time being, until we have someone to voice new dialogue entries (at least for male Reachmen - male Bretons here are far more jarring than female voices, we could reuse female Bretons for female Reachmen. Melchior did the same thing with his Chimers in Lyithdonea, using Dunmer voices, and it turned out pretty well) and I'm not really sure we'd manage to pull it off, surely not before the release. Responded here. I'm sorry for spamming with assets ideas in this thread in the first place. Can't we make the exactly same thing with the Reachmen variable? I'm not sure about the current npc-scripts (I can't look at it right now), but isn't there already a reachmen variable in there? it could be modified in usage by not merely using it like 0=not reachmen and 1=Reachmen, but 0 = not reachmen 1= tribeless reachmen 2 = Hunnath, 3 = Pachkan, etc. This should naturally come with extended documentation within the npc-script saying which tribe uses which number. By using that approach we could add reachmen to other factions still without having to look into the alternate race solution. This is just a suggestion and feel free to solve your issues in whatever fashion you prefer. I agree we should make a decision on this after the release. Either way, we'll definitely need new voice overs for the Reachmen at some point down the line. As a longstanding fan of Reachman culture in general, I can only hope that you will introduce the new race as part of your mod. I think it would certainly contribute to its attraction potential. (Until then, and I really hope you consider implementing this, I would at least include the option of using some of the painted faces in the character creation screen - I'm not a complete neophyte with the CS, but this is a bit beyond my abilities at this point). Regarding the various "tribes" of the Reach, something that would perhaps make sense is slight differences in clothing, like in the case of the Ashlanders of Vvardenfell, depending on their location. (the Grazelands Ashlanders use more animal skins than the Urshilaku and so on). This would enable the potrayal of the Reachmen as a multilayered faction, ranging from the more imperialised to "feral" outcasts. Which tribe of Reachmen live in the village west of Dragonstar? The one in -115,12? How about this for the mesa #2 tribe. 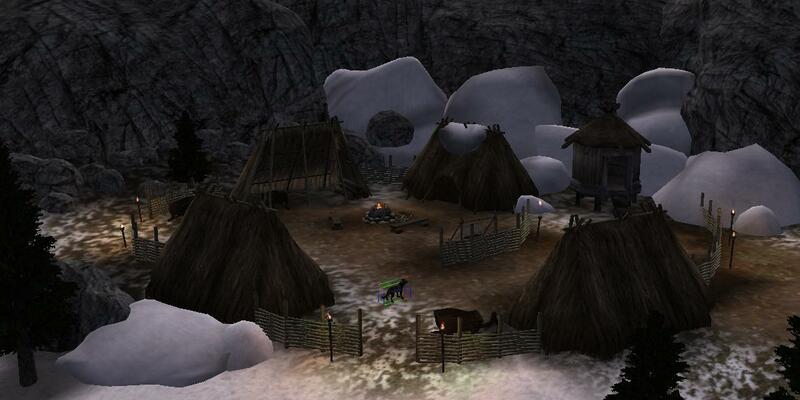 A secluded tribe living in the remote western borderlands of Skyrim's Reach. The Taliesinn maintain archaic sun worship, cultic song rituals and are rumoured to be shape-shifters. Their chief deities are Magni, god of the day, and Herwain, god of the night. They are adept witches and magic users, but are not openly hostile to outsiders. They trade with other Reachmen tribes as well as Orcish mountain tribes. There was a proposal on Discord to change the Reachmen dialogue to be more unique. We could take cues from Hrafnir's languages (https://www.imperial-library.info/conte ... eachspeech) and mix Reachmen speech patterns and words into normal Tamrielic dialogue. The use of the former would increase the farther away you get from cities. For example, the word "nith" would be added after a noun/adjective/verb to make it negative. Various words could be replaced in dialogue with their Reachmen counterparts. It'd be awkward for the player to understand at first, but they'd "pick up the language" after a while.